Prince of Angels, the latest publication of the Hotham History Project, had a dramatic launching in St Michael's Church on Hotham Hill last June. The occasion was the centenary celebration of the laying of St Michael's foundation stone by Archbishop Thomas Can in 1907. 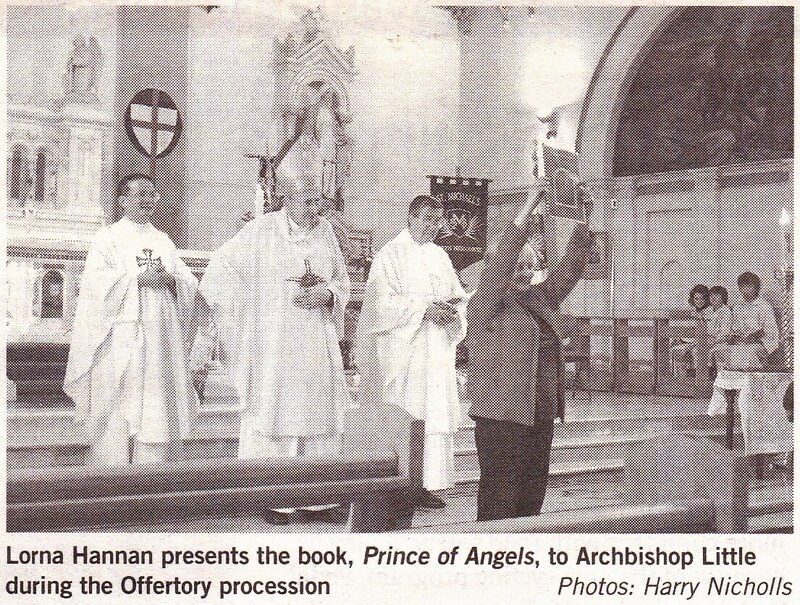 Author Lorna Hannan carried the book down the aisle at the Offertory and presented it to Archbishop Frank Little. At the end of the mass, the choir sang Handel's Hallelujah chorus from the Messiah, in Vietnamese, to the immense satisfaction and applause of the congregation. The book, with many full colour illustrations, gives an account of the establishing of the church, its iconography, its artworks and biographies of the families commemorated around the church. 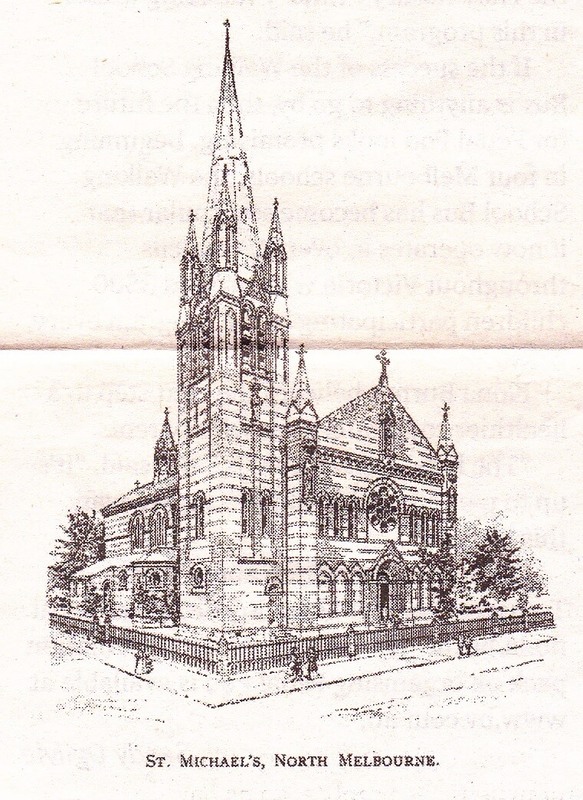 The church of St Michael opened on the first Sunday of December 1907. Its initial design by the firm of Grainger, Kennedy and Little included a spire and multicoloured brickwork. The spire was not built. John Grainger was the father of the composer Percy Grainger, but whether he or another partner did the design is not recorded. The foundation stone was laid early in June of the same year, so parishioners had the satisfaction of seeing the building grow quickly. The Advocate, a Catholic paper of the time, said it was noteworthy that the building could be completed, fitted and furnished within six to seven months. The cost of building was £7250. When it opened, £3989 had been paid, leaving £3261 still to be raised. The crowded church was blessed inside and out and later in the week was described by The Advocate as "one of the finest of the parish churches of this state". There was a high mass in the morning for which there was a guard of honour and a procession of altar boys and priests preceding the archbishop. The guard of honour was made up of officers and members of the HACBS (Hiber-nian Australasian Catholic Benefit Society) and the INF (Irish National Foresters). Other societies were not all named in reports of the occasion but included the CYMS (Catholic Young Men's Society). The procession was led by a senior altar boy carrying aloft a ceremonial cross, followed by a number of acolytes (assistants) and 20 altar boys of the parish. An augmented choir and full orchestra performed Gounod's Messe solennelle. At the end of mass there was a triumphant performance of Handel's Hallelujah chorus (in English). Miss Cauley sang the Ave Maria with violin obbligato at the Offertory, which is in the early part of the mass, and Mr McCrae sang Zingarelli's Laudate during the collec-tion late in the mass. St Michael's is unusual among Melbourne churches in having a notable series of paintings around its apse. These are the work of an Italian painter, Giorgio de Pyro, who worked in Sydney mainly and also in Queensland. Some if not all of the canvases are copies or imitations of late Renaissance paintings. The painting of St Michael above the altar, for example, is a copy of a work by Guido Reni in the church of Santa Maria della Concezione in Rome. 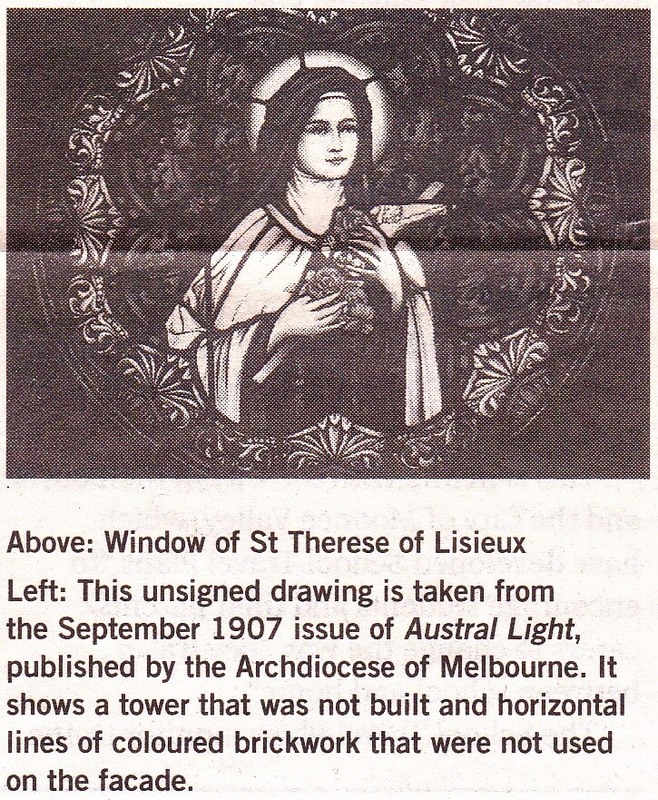 As early as 1898, Melbourne's Archbishop Carr saw this painting in Sydney and promised to have a copy of it made for the new church in North Melbourne. Another is clearly based on Raphael, but the Hotham History Project still has to identify which, if any, of the others are copies. Perhaps more notable still are the stained-glass windows, the largest of which tell the stories on which the Rosary is based. At the foot of the seventh window, which pictures The Scourging at the Pillar, are the words "Catholic Art Gallery, Munich, Germany". From the middle of the 19th century, there was a Munich style of stained-glass work, made with expert painting on relatively large glass panels and not with small pieces of coloured glass like those used by medieval craftsmen. Over several decades, windows for Catholic churches in many parts of the world came from Munich.